This well-designed, compact cell phone cabinet has 21 occupant doors. 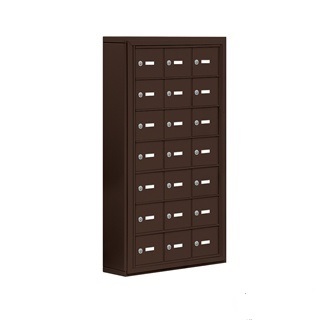 Constructed of high quality aluminum, this cell phone locker provides maximum durability. USA Building Supplies also offers custom configurations as well as surface mounted (6 ¼” depth) and recess mounted (5 ¾” depth). 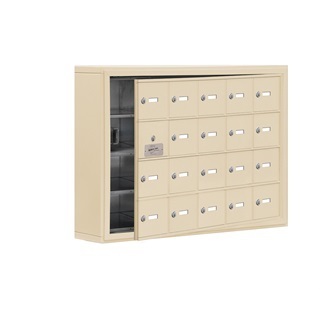 Our cell phone lockers provide users wonderful convenience and security while offered at the best value. Protect cell phones in addition to keys, tablet PCs, wallets, cameras, glasses, e-readers, important mail or other documents and other valuable items. 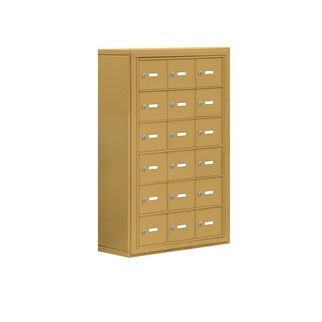 USA Building Supplies' phone lockers come available with your choice of aluminum, bronze, gold, or sandstone powder coat and ordered in custom configurations. 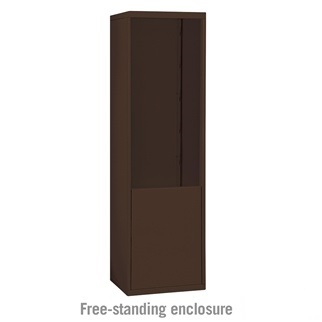 (STANDARD) Finish choices are available in four colors and the finish provides durability for your cell phone locker. Color chips can be provided upon request. (+$180.00) Combination locks are resettable and are ideal for environments when visitors change from time to time. Combination locks also provide keyless entry into guest doors. A master key also allows entry for a owner or supervisor to any of the door compartments. (NO EXTRA CHARGE) Recessed mounted cell phone cabinets are mounted into a wall opening and provide a finished appearance after installation. 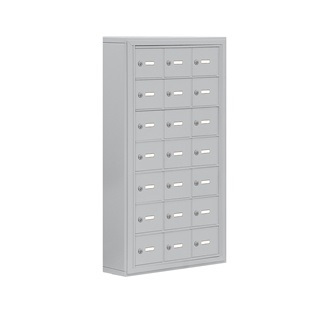 Recessed cell phone lockers are commonly ordered by customers who are planning or currently building a new building. (STANDARD) Cardholders are a type of door identification that allows the end user to identify each storage compartment door as they desire. Each door compartment comes with a 2"W x 5/8"H clear plastic cardholder and card for identifying purposes. (+$95.00) Custom engraved doors are engraved by the factory as you direct them to do so. Custom engraved doors enhance the appearance of your cell phone locker. The engraved characters will appear on the doors as a silver color because the cell phone cabinet is constructed from aluminum. (+$55.00) Custom engraved placards are another form of door id that is a self-adhesive placard that measures 2"W x 0.625"H x 0.25"D that can be engraved as you direct. (+$95.00) Custom black filled engraving is a decorative door id option which the engraved characters on the doors will appear in black. Black filled engraving door id option allows you to choose how you would like each door engraved and enhances the overall appearance of your cell phone locker. 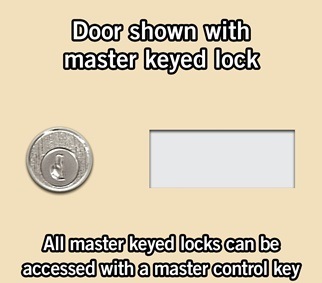 (+10.00) Master key allows an owner or supervisor entry into any of the visitor door compartments. 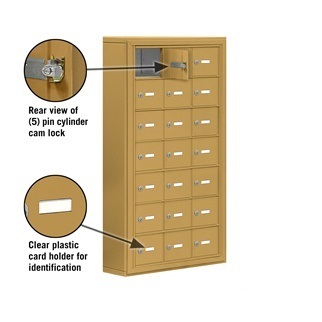 One master key is provided with each cell phone locker for master keyed or combination lock cell phone locker orders. 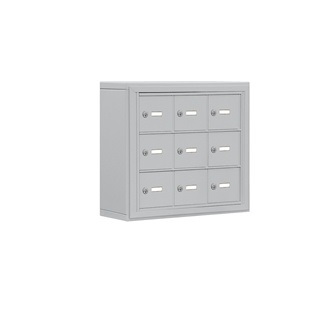 Shop cell phone cabinets and other building supply products including commercial mailboxes and anti-fatigue mats online today.